Salesforce is often the system of record for account, customer, and contact data. And many global companies have multiple instances of Salesforce that need to come together into a single view, while preserving the unique needs and processes across different lines of business. 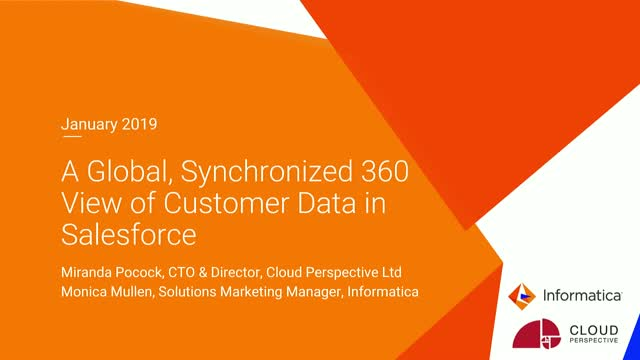 Register for this webinar today to learn more, ask questions, and hear from experts about how Informatica Customer 360 for Salesforce delivers on the promise of a corporate-wide, global customer view. Pharmaceutical companies continue to invest in several different strategies to increase R&D returns and scientific efficiency. Strategies range from increasing access to research through partnerships or acquisitions, improved execution during clinical trials and patient outreach, and incorporating real world evidence. Despite varied approaches, all strategies have a common thread: access to more data which is generated, stored and analysed in a variety of new and different methods. However, improvements in scientific efficiency will not be boosted by securing access to a larger set of data alone. Scientists and researchers must be provided with the capability to navigate through increasing amounts of available data to find, understand and prepare relevant data to boost discovery and understanding.